THE ONLY ATTENTION THAT HEAT EXCHANGERS SHOULD REQUIRE IS TO ENSURE THAT THE HEAT TRANSFER SURFACES REMAIN SUBSTANTIALLY CLEAN AND THE FLOW PASSAGES GENERALLY CLEARER OBSTRUCTION. INDICATION THAT UNDUE FOULING IS OCCURRING IS GIVEN BY A PROGRESSIVE INCREASE IN THE TEMPERATURE DIFFERENCE BETWEEN THE TWO FLUIDS, OVER A PERIOD OF TIME, USUALLY ACCOMPANIED BY A NOTICEABLE RISE IN PRESSURE LOSS AT A GIVEN FLOW. FOULING ON THE SEA‑WATER SIDE IS THE MOST USUAL CAUSE OF DETERIORATION IN PERFORMANCE. THE METHOD OF CLEANING THE SEA‑WATER SIDE SURFACES DEPENDS UPON THE TYPE OF HEAT EXCHANGER. WITH SHELL‑AND­TUBE HEAT EXCHANGERS, THE REMOVAL OF THE HEADER COVERS OR, IN THE CASE OF THE SMALLER HEAT EXCHANGERS, THE HEADERS THEMSELVES, WILL PROVIDE ACCESS TO THE TUBES. 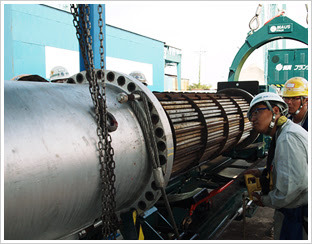 OBSTRUCTIONS, DIRT, SCALE ETC., CAN THEN BE REMOVED, USING THE TOOLS PROVIDED BY THE HEAT EXCHANGER MANUFACTURER. FLUSHING THROUGH WITH FRESH WATER IS RECOMMENDED BEFORE A HEAT EXCHANGER IS RETURNED TO SERVICE. IN SOME APPLICATIONS, SUCH AS PISTON OIL COOLING, PROGRESSIVE FOULING MAY TAKE PLACE ON THE OUTSIDE OF THE TUBES. MOST MANUFACTURERS RECOMMEND A CHEMICAL FLUSHING PROCESS TO REMOVE THIS IN SITU, WITHOUT DISMANTLING THE HEAT EXCHANGER. PLATE HEAT EXCHANGERS MAY BE CLEANED BY UNCLAMPING THE STACK OF PLATES AND MECHANICALLY CLEANING THE SURFACE OF EACH PLATE AS RECOMMENDED BY THE MANUFAC­TURERS. THE PLATE SEALS MAY REQUIRE REPLACEMENT FROM TIME TO TIME AND HERE THE MANUFACTURER’S INSTRUCTIONS SHOULD BE CLOSELY FOLLOWED. CORROSION BY SEA‑WATER MAY OCCASIONALLY CAUSE PERFORATION OF HEAT TRANSFER SURFACES. THIS WILL CAUSE LEAKAGE OF ONE FLUID INTO THE OTHER BUT THIS IS NOT ALWAYS EASY TO DETECT WHILST THE LEAKAGE IS SMALL, ALTHOUGH SUBSTANTIAL LEAKS MAY BECOME EVIDENT THROUGH RAPID LOSS OF LUBRICATING OIL, JACKET WATER ETC. LOCATION OF A PERFORATION IS A STRAIGHTFORWARD MATTER IN THE CASE OF A TUBULAR HEAT EXCHANGER, WHETHER THIS IS OF THE SHELL‑AND‑TUBE TYPE OR OF OTHER TUBULAR CONSTRUCTION HAVING DRAINED THE HEAT EXCHANGER OF SEA‑WATER AND REMOVED THE COVERS OR HEADERS TO EXPOSE THE TUBE ENDS, SOME FLOW OF THE LIQUID ON THE OTHER SIDE OF THE SURFACE WILL BE APPARENT, IN THE CASE OF OIL AND WATER COOLERS, FROM ANY TUBES WHICH ARE PERFORATED, TO TEST FOR LEAKS IN AIR COOLERS, DRAINS COOLERS ETC. EACH TUBE IN RUM CAN BE PLUGGED AT EACH END AND PRESSURISED WITH AIR; INABILITY TO HOLD PRESSURE INDICATES A LEAK. TO AID THE DETECTION OF LEAKS IN A LARGE COOLER SUCH AS A MAIN CONDENSER, IN WHICH IT IS DIFFICULT TO GET THE TUBES DRY ENOUGH TO WITNESS ANY SEEPAGE, IT IS USUAL TO ADD A SPECIAL FLUORESCENT DYE TO THE SHELL SIDE OF THE COOLER. WHEN AN ULTRA‑VIOLET LIGHT IS SHONE ON TO THE TUBES AND TUBE PLATES ANY SEEPAGE IS SEEN SINCE THE DYE GLOWS WITH IT.